NFL QB Sam Bradford when he was at Putnam City HS in Oklahoma City, along with his parents. Bradford is 1/16th Cherokee and his father, who also played football for the U. of Oklahoma, is 1/8th Cherokee. There seems to be a lot of confusion over just how American Indian Senator Elizabeth Warren is compared to other white Americans. Much of this seems to be that few Americans, other than genealogy enthusiasts, can do power of two arithmetic or take reciprocals in their heads. Heck, I screwed up my first tweet on Monday, announcing that Prof. Bustamante’s finding of one unadmixed Native American ancestor within a probability range of 6 to 10 generations ago, most likely 8 generations ago, meant she was most likely 1/256th Indian (which I got right), or 0.2% (which is wrong, it’s 0.4%). Carl Zimmer of the New York Times is adamant that Senator Warren might have additional Amerindian ancestry that, through her bad luck, has been genetically lost. It’s important to keep in mind that the genetic reshuffling that happens at conception is not exquisitely random, it’s more like a child’s lumpy attempt at shuffling decks of card s.
For example, it’s likely that millions of Americans are descendants of King Edward I of England (1239-1307). On the other hand, most of his current descendents have zero DNA segments that directly descend from this king, so a DNA test would not prove they were descended from him if his bones were dug up and sequenced. On the other hand, a few of his descendants probably do have segments of his DNA. So Zimmer’s point is true, but it’s also true that Senator Warren’s Amerindian ancestry might appear exaggerated in a DNA study through luck. That’s why Prof. Bustamante estimated a range of six to ten generations ago, with eight as the most probable. Somebody tweeted that Warren might be less Indian than the average self-identified white American. If Warren had a single Native American ancestor ten generations ago, that would make her 1/1024 Indian, or 0.1%. A 2013 study by 23andMe of their customers who self-identified as white found they were 0.18% American Indian on average. On the other hand, Bustamante said Warren appeared to be about 10 times more American Indian than his reference sample of self-identified American whites, who were drawn from Utah (i.e., mostly Mormons). Utah whites have been used by geneticists going back to the HapMap about 15 years ago as a proxy for Northwestern Europeans. The Mormons tended to be recruited either from white Americans who weren’t frontiersmen or from northwestern Europe. For example, the Romney family arrived in America from England, where Miles Romney, a convert to Mormonism, was a first cousin of the superb English society painter George Romney, who was intensely English-looking. In contrast, other ethnicities of American whites, such as East Coast ethnics like Martin Scorsese and Donald Trump aren’t very Amerindian at all. On the other hand, the Scots-Irish might be slightly more likely to have an Amerindian ancestor because they tended more often to be frontiersmen. For example, I have a brother-in-law who was born in West Virginia and served 20 years at the bottom of the ocean as a nuclear sub powerplant technician. Whether he has any Indian ancestry or not is uncertain (he was orphaned young), but he’s a teetotaler: whether he’s part Indian or all Scots-Irish, he thinks it’s a good idea to avoid liquor. It’s a complicated question whether there was more stigma or glamor associated with being somewhat American Indian by ancestry in the past. Current Year people tend to assume that the stigma associated with being part black applied to other races, but that’s not at all indisputable. For example, Westerners such as Mark Twain tended to be prejudiced against part-Indians (e.g., compare the villainous half-breed Injun Joe in Tom Sawyer to the lovable slave Jim in Huckleberry Finn), but Easterners such as James Fenimore Cooper tended to be prejudiced in favor of part-Indians. Over time, as Indians stopped being a threat, opinion shifted in their favor. For example, Herbert Hoover’s vice president Charles Curtis may have been 3/8ths Indian. As a child, he lived on an Indian reservation in Kansas and spoke Kaw before he spoke English. This seems to have added a little glamor to his resume. TAHLEQUAH, Okla. — … Entering Saturday’s Red River Rivalry between No. 1 Oklahoma and No. 5 Texas, Bradford is at the forefront of Heisman Trophy conversations, and at the center of attention in the Cherokee Nation, the second-largest tribe in the United States. 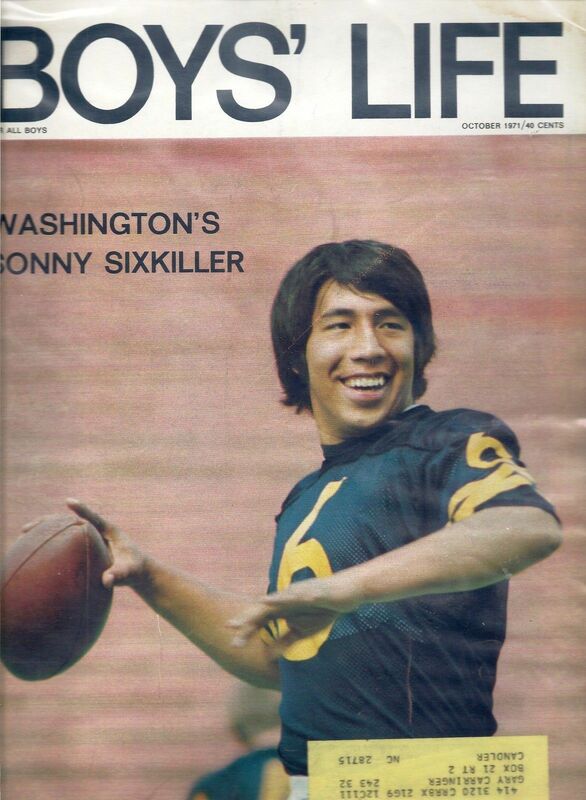 Bradford is believed to be the first Cherokee to start at quarterback for a Division I university since Sonny Sixkiller, a full-blooded Cherokee, who was born here and starred at Washington in the early 1970s. But Bradford is just one-sixteenth Cherokee and until Oklahoma publicized that heritage last season, his father Kent said he had probably only talked to his son about it two or three times as he grew up in Oklahoma City. Kent Bradford said his great-grandmother, Susie Walkingstick, was a full-blooded Cherokee. The elder Bradford, who was an offensive lineman at Oklahoma in the 1970s, said: “There’s a lot of people in Oklahoma that have Indian blood. I wasn’t brought up to really know much about it. I can’t really give him a lot of information either. Jim Thorpe, the great athlete who is thought of as Indian, but was part white on both of his parents’ sides. Will Rogers, the radio comedian who might have been the most popular celebrity in America in the early 1930s. He is said to be 9/32 Cherokee. Maria Tallchief, the most famous American ballerina of the 1950s, whose father was the chief of the oil-rich Osage Indians. Chuck Norris, martial arts actor, claims to have some kind of Cherokee roots. Johnny Bench, catcher for the 1970s Reds, is said to be 1/8th Choctaw. Robert L. Owen, one of the first two Senators from Oklahoma (along with the blind Thomas Gore, Gore Vidal’s beloved grandfather). In 1906 as the lawyer for the Eastern Cherokee, he won a settlement of nearly $5 million from the federal government for Cherokee lands in the east taken in the 1830s. In the Senate, his Glass-Owen bill founded the Federal Reserve. His mother was 1/8th or 1/16th Cherokee, but skillfully emphasized her Indian roots. Other Oklahomans claiming Indian descent include evangelist Oral Roberts. American Indians who ended up in the Oklahoma territory include Sequoyah, inventor of the Cherokee alphabet, and Stand Watie, the Confederate general. Oklahoma-born celebrities who probably weren’t at all Indian include Mickey Mantle, Brad Pitt, and Woody Guthrie. I get the impression from looking at lists of famous Oklahomans that Oklahomans, for better or worse, tend to be more American than you or I could ever hope to be.